No matter what your skill level, Peppperstone Group is a broker that can be used by traders for CFD, forex, cryptocurrency and other types of trading. The vast range of educational materials and tools is designed to appeal to both novices as well as experienced traders. Retail and institutional investors can make use of Pepperstone for using instruments such as forex as a class of assets and part of their trading strategy. The broker is always striving to deliver fast execution, low-cost pricing, the best trading platforms, top customer support and a reliable infrastructure to its users. When using Pepperstone, traders are able to get direct access to several liquidity destinations in the forex market without having to put up with other issues or using a deal desk. The company was founded in 2010 by a veteran management team as they put years of experience in forex and technology to good use. The team noticed that traders were becoming increasingly frustrated when they were using online-based forex services because of excessive spreads, poor customer support and trade execution delays. Therefore, they decided to create Pepperstone and from the beginning, its aim was to overcome all these problems through low-cost spreads, exceptional customer service, superior technology and low-latency execution. One of the primary purposes of Pepperstone is to make trading easier for all retail investors. Thus, it shouldn’t come off as a surprise that the broker offers a ton of instruments for trading. Almost 70 forex currency pairs are available on the platform and all major pairs have spreads that start at just 0 pips. A flexible leverage is available of about 500:1 and there is focus on low latency, high-quality execution and a reliable trading structure. Other than forex trading pairs, you can also trade CFDs with the broker and these include indices, commodities, metals, cryptocurrencies and more. When it comes to index CFDs offered by Pepperstone, you will come across 14 major global stock indices without requotes, hidden markups and with low latency. You will get access to new markets that will enable you to vary your trading opportunities and diversify your trading strategies across the global equity markets. It is possible to buy or short sell the major stock indices without commission. There is no commission on energy trading either and you can enjoy flexible leverages and minimum trade sizes. You will come across both major oil markets, West Texas Intermediate Crude Oil and Brent Crude Oil, natural gas and more. The minimum trading size of all trading instruments start at 10c per pip and leverage of about 500:1 is available. Precious metals from Pepperstone have flexible leverage options, fast execution, low-cost pricing models and no commissions, which makes them an excellent way to diversify your trading strategies. Six precious metal pairs are available on Pepperstone, which include gold, palladium, silver and platinum against EUR or USD. These assets often move along with market cycles and inflation. Another choice available to traders for diversifying their portfolio on Pepperstone is through soft commodities as the moving and delivering of physical assets determines the price. Soft commodities that can be traded on Pepperstone include cotton, cocoa, coffee, orange juice and sugar, all of which have a 2 percent used margin for every lot. If you are interested in trading cryptocurrencies, Pepperstone offers you the opportunity of trading Bitcoin, Dash, Bitcoin Cash, Ethereum and Litecoin, all against the US Dollar. You can get leverage of around 5:1 with these trading instruments and this makes it possible for traders to be able to invest in crypto without actually having to buy it and put it in the cryptocurrency wallet. Furthermore, when you are trading crypto on Pepperstone, you can hedge on a single account. There are four main types of accounts you can open on Pepperstone, which include the Edge Standard Account, the Edge Razor Account, Edge Active Traders Account and Edge Swap-Free Account. Institutional grade STP spreads are available with Edge Standard Accounts and no commission is charged. Through this account, traders can enjoy liquidity from 22 banks, negative balance protection and trade via MetaTrader 4, all from a firm regulated in Australia. The interbank spreads begin at just 1 pip. You can get spreads from 0 pips and commissions begin at $3.50 when you sign up for the Edge Razor Account. Raw interbank direct pricing are the spreads available for this account. The average spread for EUR/USD is between 0 and 0.8 pips. The commission of AUD$3.50 is applicable for every 100,000 traded. The minimum trade size for this type of account is 0.01 lots and the maximum trade size is of 100 lots. The leverage available is 500:1. You need to have an opening balance of $200 AUD for this type of account or the equivalent of this amount in other base currencies such as USD, EUR, CAD, GBP, SGD, JPY, NZD, HKD and CHF. Edge Razor accounts also allow hedging, EAs and scalping. There is $0 commission, no interest and STP spreads available in Edge Swap-Free Accounts. This type of account has been especially designed for traders who are unable to receive or pay swaps. As there are no swaps, the spreads are processed straight through. The minimum account balance required is $200 USD or its equivalent in other currencies. The average spread for EUR/USD is 1 to 1.2 pips and the minimum and maximum trade size is 0.01 lots and 100 lots respectively. This account also allows for scalping, hedging and EAs. If a trade is held for two days on this type of account, an admin charge will be made by Pepperstone as per the clear table of commissions available on the website. The last is the Edge Active Traders Accounts and is designed for institutional or high volume traders. Spreads begin at 0 pips and you need to get in touch with Pepperstone for pricing. Traders who are qualifying for the Active Trader Program can get cash rebates for their trades and save almost 43 percent on trading commissions. The rebates are dependent on the number of standard lots that are traded monthly. Higher rebates are given to higher trading volumes. Pepperstone stands out from its competitors with the fact that it pays rebates daily and straight into your account the next day after the position is closed. The rebate can be used by traders right away. Qantas points can also be earned by active traders through the Qantas Frequent Flyer program. They can benefit from complimentary VPS hosting that can be used for running automated strategies, get priority customer support with a dedicated account manager and also access exclusive reports and insights like daily market analysis and Autochartist signals from Pepperstone. A demo accunt is also available on Pepperstone for those who wish to practice first before they start trading with actual money. When trading on Pepperstone, you have the option of using cTrader or the ever-popular MetaTrader 4. cTrader is compatible as cAIgo, a WebTrader or mobile. MetaTrader 4 is compatible with Mac, Windows, the Web Trader via choice of browser, Android, iPhone, and tablets (both iOS and Android). Not only is it user-friendly, MetaTrader 4 is loaded with features such as Expert Advisors and other automated strategies, enhanced charting functionality, a Navigator Window, order execution capabilities, a Market Watch window, multiple chart setups, 85 preinstalled indicators and analysis tools. Traders can take advantage of first-class charting with real-time data export, unlimited charts and secure trading. Pepperstone also offers support for MetaTrader 5, which has 38 built-in indicators, a built-in economic calendar, the ability to hedge positions, optimized processing speeds, 21 time frames and advanced pending orders. A robust trading infrastructure is offered by cTrader along with top-tier liquidity and lightning-fast speed. 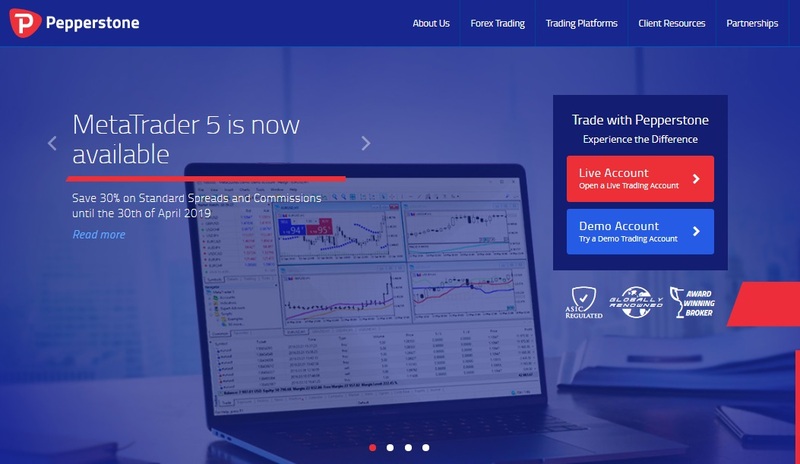 Since it was designed by traders and for traders, cTrader has a very user-friendly and customizable user interface with enhanced charting abilities and order management systems. It includes extensive backtesting facilities, level II pricing, detachable charts, next-generation user interface and charting techniques and automated trading via a dedicated platform. There is a very impressive section on Pepperstone that’s dedicated to education and it includes a glossary and FAQ. You will also come across informative Trading Guides on a variety of topics, a section dedicated to learn how to trade forex and free webinars for traders of all skill levels. It is easy to get in touch with the customer support team on Pepperstone as there is a live chat option on every page of the website. The phone number of the broker can also be found at the bottom of every page or you can click on the ‘Contact Us’ tab on top. Here, you will find the physical address of the broker as well as their 24-hour online support options i.e. live chat and email as well as numbers for 24-hour phone support. There are different base currencies offered on Pepperstone, which is the currency of your account and the one used for making deposits. Your options include British pound sterling (GBP), the Australian Dollar (AUD), United States Dollar (USD), New Zealand Dollar (NZD), Swiss franc (CHF), Hong Kong Dollar (HKD), Singapore Dollar (SGD), euro (EUR), Canadian Dollar (CAD) and Japanese yen (JPY). You will find an extensive list of methods that you can use for depositing funds into your account on Pepperstone, which include credit and debit cards and e-wallets. You can use MasterCard Secure Code, Visa or Master Card, Verified by Visa, POLi for an instant bank transfer, PayPal, China Union, Skrill (Moneybookers), Fasapay, Qiwi, Neteller, BPay transfers from Australian banks, traditional domestic or international bank transfers, broker-to-broker transfers and other local funding methods. A number of these methods enable instant funding 24/7, but you should check the particular time frame for your selected method. It typically takes two to three days for broker-to-broker transfers. No fees will be charged by Pepperstone for a deposit or withdrawal. However, a conversion fee or transfer fee might be charged by your payment provider. It should also be noted that third-party payments are not accepted by Pepperstone, which means the name on your account on the platform as well as those from which you are making the transfer should be the same. As per third-party transaction regulations, funds can only be returned to a bank account that has the same name as your account on Pepperstone. If you are making a withdrawal with your credit card, you should know that you can only withdraw as much as you deposited with the card. After that, another method has to be chosen. If you have added funds to your account via a credit card and make a withdrawal within 60 days, the amount will have to go back to the same credit card. If the withdrawals are received before 21:00 GMT they are processed the same day. Otherwise, they will be processed on the following day. As for bank wire transfers, they will typically take three to five days to be processed. Based out of Melbourne, Australia, Pepperstone also has additional offices in Dallas, Bangkok and London. As it is based in Australia, the broker is regulated by ASIC (the Australian Securities and Investment Commission) as well as the Financial Conduct Authority (FCA). It has a very strong culture of regulation and compliance and it keeps client funds secure by segregating them. On a whole, Pepperstone is a well-respected and notable online broker that offers traders in different parts of the world the opportunity to trade forex, crypto, indices, commodities and other instruments. As it is regulated in the UK and also in Australia, it provides reassurance that you are not investing your money in a scam. Pepperstone allows its traders to trade on multiple devices by using MetaTrader 4 or cTrader, as per their preference. There are a number of account types, low commissions, tight spreads and also low minimum deposit requirements, making it ideal for traders of all skill levels.